Objective: Effective strategies are needed to encourage smoking cessation for smokers without an intention to quit. We systematically reviewed the literature to investigate whether smoking reduction therapy can increase the long-term cessation rates of smokers without an intention to quit. Methods: PubMed, Embase, and CENTRAL (Cochrane Central Register of Controlled Trials) were searched for randomized controlled trials (RCTs) on the effect of smoking reduction therapy on long-term smoking cessation in smokers without an intention to quit. The primary outcome was the cessation rate at the longest follow-up period. A random effects model was used to calculate pooled relative risks (RRs) and 95% confidence intervals (CIs). Results: Fourteen trials with a total of 7981 smokers were included. The pooled analysis suggested that reduction support plus medication significantly increased the long-term cessation of smokers without an intention to quit compared to reduction support plus placebo (RR, 1.97; 95% CI, 1.44–2.7; I2, 52%) or no intervention (RR, 1.93; 95% CI, 1.41–2.64; I2, 46%). In a subgroup of smokers who received varenicline or nicotine replacement therapy (NRT), the differences were also statistically significant. This suggests the safety of using NRT. The percentage of smokers with serious adverse events who discontinued because of these events in the non-NRT group was slightly significantly different than in the control group. Insufficient evidence is available to test the efficacy of reduction behavioural support in promoting long-term cessation among this population. Conclusions: The present meta-analysis indicated the efficacy of NRT- and varenicline-assisted reduction to achieve complete cessation among smokers without an intention to quit. Further evidence is needed to assess the efficacy and safety of reduction behavioural support and bupropion. Funnel plots (plots of effect estimates against sample size) may be useful to detect bias in meta-analyses that were later contradicted by large trials. We examined whether a simple test of asymmetry of funnel plots predicts discordance of results when meta-analyses are compared to large trials, and we assessed the prevalence of bias in published meta-analyses. Medline search to identify pairs consisting of a meta-analysis and a single large trial (concordance of results was assumed if effects were in the same direction and the meta-analytic estimate was within 30% of the trial); analysis of funnel plots from 37 meta-analyses identified from a hand search of four leading general medicine journals 1993-6 and 38 meta-analyses from the second 1996 issue of the Cochrane Database of Systematic Reviews. Degree of funnel plot asymmetry as measured by the intercept from regression of standard normal deviates against precision. In the eight pairs of meta-analysis and large trial that were identified (five from cardiovascular medicine, one from diabetic medicine, one from geriatric medicine, one from perinatal medicine) there were four concordant and four discordant pairs. In all cases discordance was due to meta-analyses showing larger effects. Funnel plot asymmetry was present in three out of four discordant pairs but in none of concordant pairs. In 14 (38%) journal meta-analyses and 5 (13%) Cochrane reviews, funnel plot asymmetry indicated that there was bias. 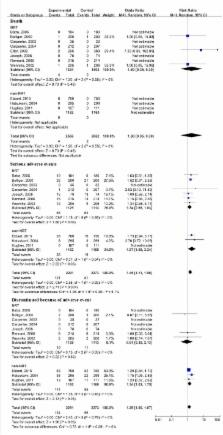 A simple analysis of funnel plots provides a useful test for the likely presence of bias in meta-analyses, but as the capacity to detect bias will be limited when meta-analyses are based on a limited number of small trials the results from such analyses should be treated with considerable caution. [* ]Author to whom correspondence should be addressed; E-Mail: yhe301@ 123456x263.net ; Tel. : +86-10-668-76-411; Fax: +86-10-682-19-351. Practice-based referrals to a tobacco cessation quit line: assessing the impact of comparative feedback vs general reminders. Bupropion for smoking cessation in African American light smokers: a randomized controlled trial. Smoking, smoking cessation, and understanding of the role of multiple cardiac risk factors among the urban poor.